What girl doesn’t derive pleasure from choosing a lipstick? You can do it endlessly! Your whole appearance and the impression you make on others depends largely on your lip makeup skills. Let's look at some of the things you should consider when choosing a lipstick or a lip gloss. There are many types of lipstick: matte and glossy, durable and satin, nourishing and moisturizing... Each has its pros and cons; the only question is, what is the priority for you? For example, satin lipstick is nice on the lips, but it is not durable. Matte lipstick is now in trend, but it visually reduces the lips and emphasizes all the flaws of the skin. First, decide what you wish for and assess your individual characteristics—the condition of the skin of your lips, their shape, and also the color of your skin and hair. Women with light skin should choose natural, gentle tones. Dark-skinned girls should pick up a bright shade of lipstick. There are a lot of nuances, ranging from your age and the color of your teeth. For example, older women should abstain from frivolous gloss and from very dark lipstick, using it only for special, festive occasions. And if your teeth are far from ideal, displaying a yellowish tint, then all "warm" colors from peach to terracotta should be avoided. How to choose a lipstick? How to choose a lip gloss? Coming to the store, do not use testers. It is unhygienic because you don't know who used them before. 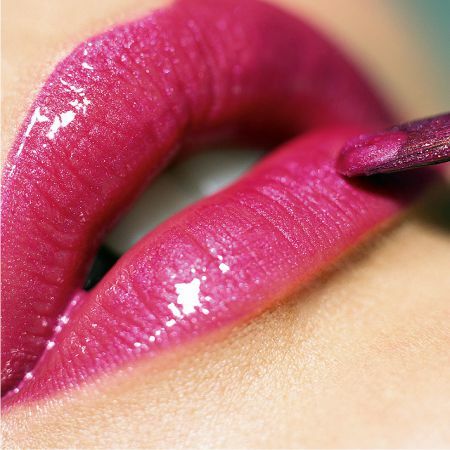 It is better to apply a little lipstick on the tester or on your fingertip. This will provide the most accurate representation of how a lipstick or gloss will look on your lips. Pay attention to how convenient the brush is and what the expiration date is, its composition, and the presence of a UV filter. Usually, the lipstick includes wax, moisturizing oils, and colorants which, in fact, give the lipstick color. Collagen and various vitamins will improve the condition of your lips and maintain their youth. Be careful and do not hesitate to ask questions. This will help you avoid mistakes like buying a product that will soon disappoint you and be at the bottom of your purse. Choose your lipstick wisely and feel beautiful and happy! Like the article «Choosing a Lipstick and a Lip Gloss»? Share it with friends!